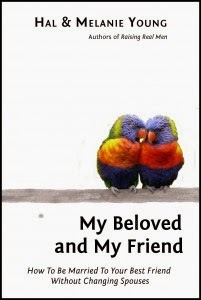 Book - My Beloved and My Friend: How to Be Married to Your Best Friend without Changing Spouses. I have to tell you... the first time I saw the cover of this book, I didn't understand the birds. After I had an actual copy in my hand and read half of it, I realized it must be an example of "love birds!" There is something about that saying, "love birds," that make one think of a life-long, happy, relationship. There is no separating them! This is really what the Young's book is about - building and maintaining a strong marriage, even in this modern world! I love that Hal and Melanie worked together to write this book. They share personal experiences, memories, observations and lots of research. As parents of 8 children, and married for almost 30 years, they have plenty of insight into family life and marriage! The tone of the book is open, friendly, conversational - mixed with some powerful lessons, and incredible insight. - Who should be the financial provider in the relationship? - Handling severe health problems. - Reasons and research for the blessing of children (whether there is one child or many). - Safeguards for the relationship and strength of the marriage (and family). - Startling research into how the culture has damaged the vision of a godly marriage. There is one section, in particular, from the book that was significant. They discuss painful and exhausting health problems and how they kept their marriage strong through it all. Yet, a more difficult strain on a marriage was briefly described. It was Melanie's grandparents. Her grandfather was described as a very difficult man. His wife remained by his side; and in their old age, their love and devotion to one another is incredibly beautiful! In this book, you may find controversial portions. You may see things you don't agree with. Yet, the book will get you thinking! It will work as a tool to help make your own marriage strong. Please realize - We need books like this, that help strengthen marriage! We need them desperately! This book will be released early next year. In the meantime, you can pre-order a copy at a special price of $12 (with free shipping), directly from the Youngs. You are welcome to read more reviews, by other bloggers, at Bow of Bronze. To find out more about my commercial breaks, please see my disclosure page.